Any restaurant that has a ‘frommelier’ wheeling his laden trolley between tables is going to steal the hearts of Londoners. It’s hard for your eyes not to slip away from your partner’s face to follow the creamy mountain of artisan cheeses as it rolls past every five minutes. It’s equally hard to save room for the cheese course that you simply must give in to. We give in at the first hurdle by ordering the tasting menu, including a selection of the cheeses. Make the decision upfront, then look forward to it – best motto. 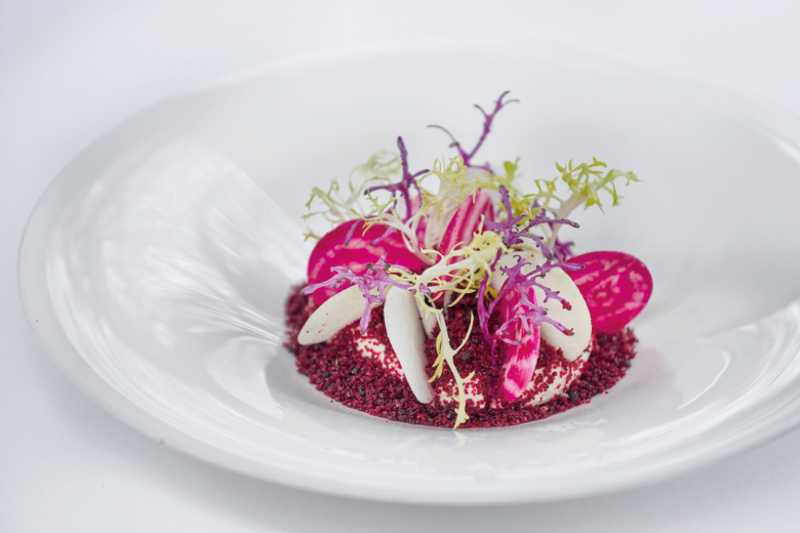 Orrery is 21 this year and has marked that coming of age with a new look and menu. Lavender panelling and terracotta clay pots emphasise its Provençal inspiration; interesting twists to accompaniments and a refocus on local ingredients bring the menu bang up to date. But loyal customers will still recognise their beloved local favourite, first opened by Terence Conran in 1997, when Marylebone was a shabby chic postcode. 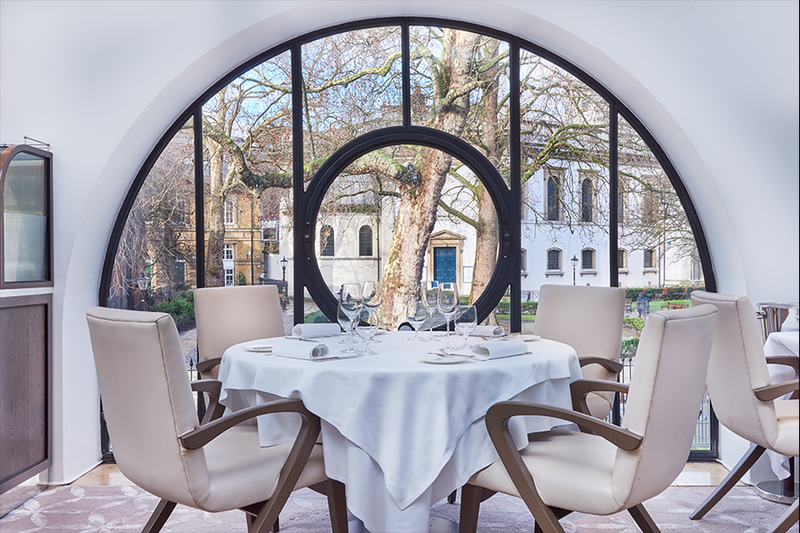 Fashions come and go, but Orrery is likely to remain as one of London’s most timelessly elegant restaurants. This is partly thanks to its enviable position overlooking the leafy St. Marylebone churchyard – through arched windows which draw in the light like a mini Musée d’Orsay. But most credit should go to the genius and sheer confidence of head chef and patron, Igor Tymchyshyn. Our tasting menu extravaganza begins with meaty Dorset crab with a fun touch of wasabi, avocado and mango, followed by melting duck and chicken liver parfait. Then comes the faultless, signature tournedos Rossini, served with celeriac and sauce périgourdine. And now for that trolley… the passionate frommelier talks us through the provenance of each spectacular farmhouse cheese we point at – until we finally narrow down our choice to five. A moment’s silence, please, for those. Finally, we coo over lemon posset with oats, almond and Granny Smith. The meal is so utterly sophisticated and splendid it will make us happy for days afterwards. But the genuine largesse and hospitality at Orrery also feeds our warm glow. As we head for our coats, our waiter more or less chases us to the door with the chocolate truffles we have somehow overlooked. Long live Orrery.